All Precision UK’s CPX Bed Head Units are manufactured under BS EN 13485 Medical Devices: Quality Management Systems. They are designed and built with a view to provide smooth lines, a stylish finish and pleasing aesthetics in order to blend into the room décor. The unit is in accordance with the British Department of Health Memorandum No 2015 (HTM 08-03). 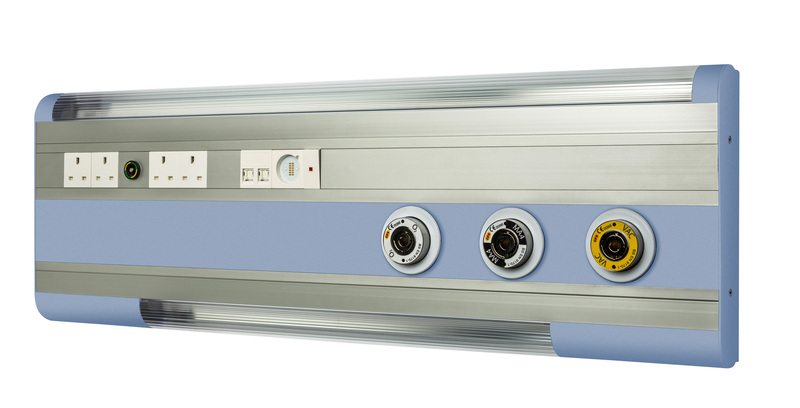 Built from individually heat treated extruded aluminium sections, the unit provides separate compartments for medical gases and electrical services. Furthermore, the gas compartment is ventilated to prevent a buildup of gas inside the unit. 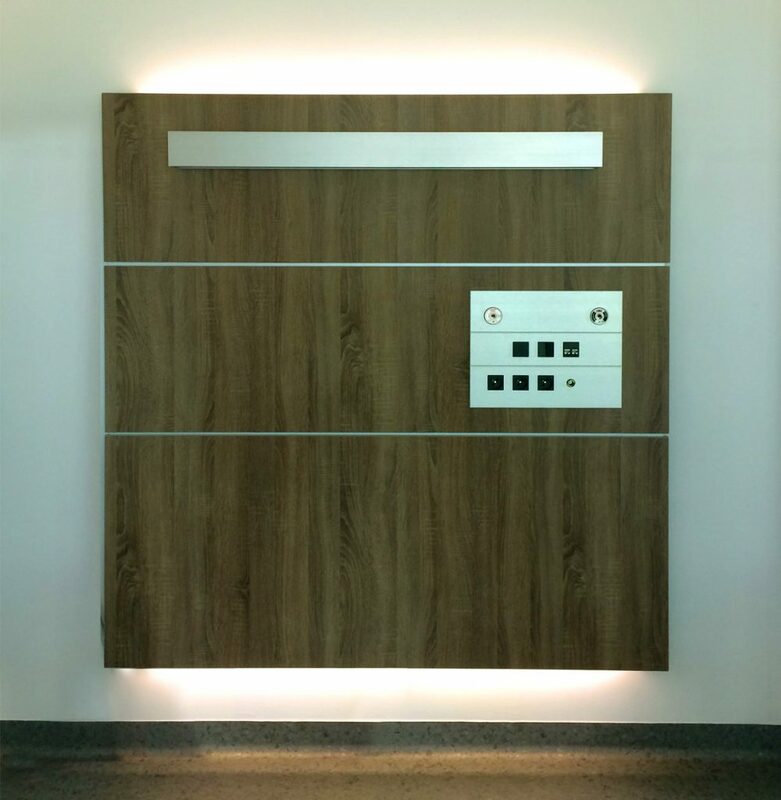 There are separate panels for low voltage (LV) and protective extra-low voltage (PELV) services. This allows access to the PELV section for servicing without having to isolate the LV circuits. Medical gas outlets are located in an individual compartment which both this and the cover are completely insulated from electrical elements. Any number of medical gas outlets can be accommodated depending on the length of the unit. 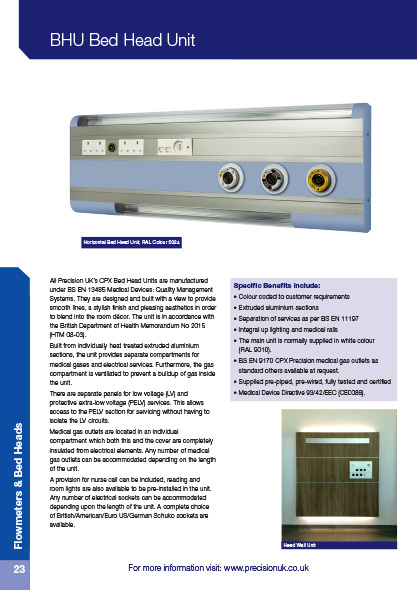 A provision for nurse call can be included, reading and room lights are also available to be pre-installed in the unit.Any number of electrical sockets can be accommodated depending upon the length of the unit. A complete choice of British/American/Euro US/German Schuko sockets are available. The main unit is normally supplied in white colour (RAL 9010). BS EN 9170 CPX Precision medical gas outlets as standard others available at request.